Used to edit the grid records through a form. In the generated grid a link will appear on each line to edit the record. Clicking in the link, the selected form is displayed according to selected format (in an iframe, in the same window or in a new window). 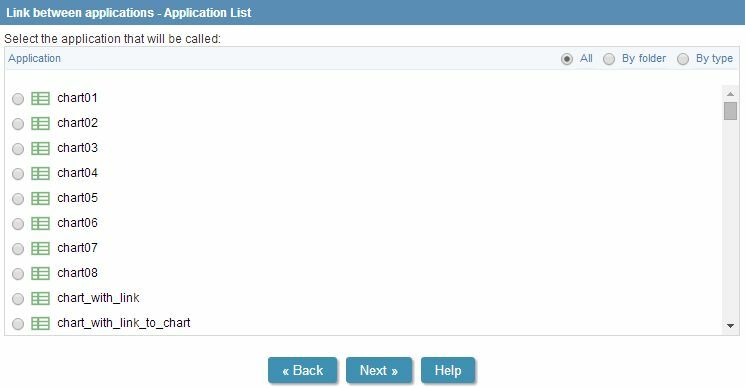 Application: Select the form application called by the grid. Open in the same window Display the form in the same browser window, (in another page, the form display substitute the grid). Open in another window Another window opens to display the form . Display the New button on the grid - The button New is displayed on the grid´s toolbar to add new records. Shortcut Key to the New button - Define the shortcut key to the add New button. Called application exit URL - Called form exit URL. Default address (back button) is the calling grid. Select the buttons to be displayed in form. Enable Insert button - Enables the buttons New and Insert in form. Enable Update button - Enables the Update button in form. Enable Delete button - Enables the delete button in form. 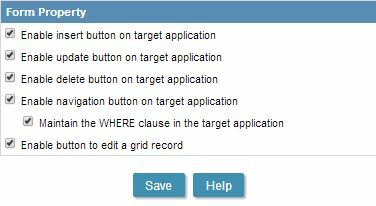 Enable button to edit a grid record - Enables a button to edit a grid record in form. Iframeproperties - Displayed only when Link Operation Mode is Open in Iframe. 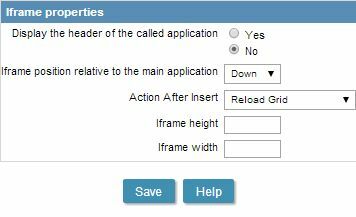 Display the called application header - Display form header.